Pasta Lovers Rejoice! 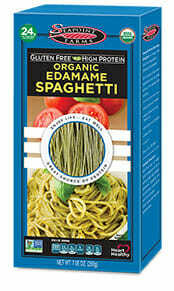 Seapoint Farms Heating Up Alternative Pasta Category With Deliciously?Authentic, Protein-Rich, Gluten-Free & Low Cal Organic Edamame Spaghetti. Easy to prepare, truly delicious and packed with plant-based protein, Seapoint Farms? highly-popular new pastas are sold for a MSRP of $3.99 at such leading markets as Whole Foods, Sprouts, Ralphs, Bristol Farms, Gelson?s, Smart & Final, Daley?s, Stater Bros. and Vons, among many other stores. Seapoint Farms? entire family of products can also be purchased on Amazon.com or on the?www.seapointfarms.com?site.